Plenty of water has flown through Jhelum and Chenab rivers in last five years. The Lok Sabha elections in 2014 were fought on Modi wave in Jammu region and People’s Democratic Party (PDP) groundswell in Kashmir. First time in the electoral history of Kashmir, the PDP swept the entire region to register a win in Baramulla, Srinagar and Anantnag constituencies. The BJP also created history by winning Ladakh, Udhampur and Jammu constituencies. The Congress and National Conference suffered the worst defeat. Stalwarts like Ghulam Nabi Azad were trampled to bite the dust. In 2019, the biggest question is whether the Lok Sabha polls can be held in the backdrop of the explosive security situation in Kashmir. The experiment of holding panchayat and municipal polls at the fag-end of 2018 with abysmally low turnout in Valley, must have given confidence to the authorities to hold the parliamentary elections. Therefore, a prolonged schedule would be announced to hold the elections under heavy military presence. Not bothered about the turnout, keeping militants at bay and holding anti-election campaigners under check would be the top priority. This explains the uptick in the anti-militancy campaign. Separatists, jailed or house-arrested, are unlikely to get a breather. The Lok Sabha has always evoked a lukewarm response from the people. This time around, it is colder even in Jammu and Ladakh regions. No wave or groundswell is visible in any part of the state. The lack of enthusiasm in Kashmir has also left an impact on the psyche of Jammu. In the previous election, Dr Jatinder Singh, BJP’s erudite Hindutva campaigner, cruised through in Udhampur constituency that has a sizeable Muslim population in Chenab Valley. The Muslim vote was divided that led to a humiliating defeat of Congress candidate Ghulam Nabi Azad. Singh rode on the glory and became Modi’s trusted minister in the PMO. Jugal Kishore, the then BJP state president, was fielded from Jammu constituency. He also won hands down. The victory in Udhampur and Jammu constituencies set the actual stage for the BJP to sweep the assembly polls in Jammu. Observers say that abysmal performance of the BJP ministers, legislators and MPs, the perpetual decline of Modi’s popularity and failure of BJPDP government has led to the decline of BJP in Jammu region. The consciousness among the Muslims in the region is also going to hamper BJP’s prospectus. If the Congress and NC are able to forge a pre-poll alliance, the BJP would be in a tight spot. The BJP won the Ladakh Lok Sabha seat by a whisker in 2014, thanks to the division of Congress votes in Leh and Kargil districts. The Buddhists merged Ladakh Union Territory Front (LUTF) into BJP with the hope that Modi government would ensure separation of Ladakh region from J&K. It did not happen even as the process of devolution of powers to the Ladakh Autonomous Hill Development Councils was fast-forwarded. Consequently, MP Thupstan Chewag resigned from the BJP. This ended the party’s foray into the region. In the upcoming elections, it is highly difficult for the BJP to find a candidate for Ladakh constituency. The election for the three constituencies in Kashmir would be the most interesting phenomenon to watch. The south Kashmir’s Anantnag remained unrepresented since 2016 after Mehbooba Mufti quit the seat to become the Chief Minister. She fielded her brother Tasaduq Mufti in April 2017 by-poll but the election was cancelled at the last minute following large-scale violence in Srinagar-Budgam constituency. The inability to conduct the Anantnag by-poll, in spite of repeated review of the security situation, is indicative of the ground situation in south Kashmir. The political players find it tough to establish contact with the people who are indifferent to the process. A few public contact programmes held by Mehbooba and Abdullahs’ – Farooq and Omar – were conducted under tight security watch. None of the parties has thrown indications on the choice of their candidates. Tariq Hamid Karra won the Srinagar Lok Sabha seat in 2014 slaying a goliath like Farooq Abdullah. This was one of the biggest upsets in the electoral history of Kashmir. Karra, however, resigned in 2016, in protest against the “unholy alliance” of the BJPDP. He attained the distinction of being the lone crusader who resigned in protest against the BJP and its scorched earth policy in Kashmir. Karra later joined the Congress and even campaigned for Farooq Abdullah in the by-poll. Even as senior Abdullah won the by-poll, the polling day turned out to be one of the bloodiest days in recent Kashmir history. At least 10 anti-poll campaigners were brutally killed and scores were injured during the day that recorded meagre 7.1 per cent polling. Many observers say that Abdullah should have resigned in protest but he clung to the chair for his lust of power. 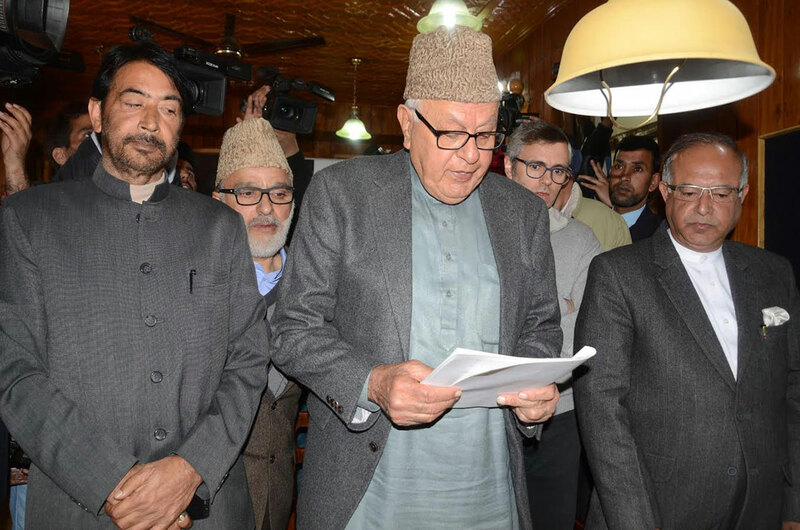 Ghulam Ahmad Mir, Ali Mohammad Sagar, Dr Farooq Abdullah, Omar Abdullah and Tariq Hameed Karra. Baramulla constituency would be the most interesting arena to watch. Unlike south and central Kashmir, the voter turnout would be higher. This constituency was represented by Muzaffar Beigh, now PDP patron, who could not make any impact during his term. Apart from NC and PDP, the Sajad Lone’s People’s Conference would attempt to create an impact in the constituency. The most interesting feature of the Baramulla segment would be the electoral plunge of former IAS officer Shah Faesal who is likely to file his nomination papers from north Kashmir. The 2019 polls have a strange complexion. The uncertainty is looming large as never before.